We’re still not convinced that eating a sandwich made on a waffle instead of bread is something grownups have any business doing. 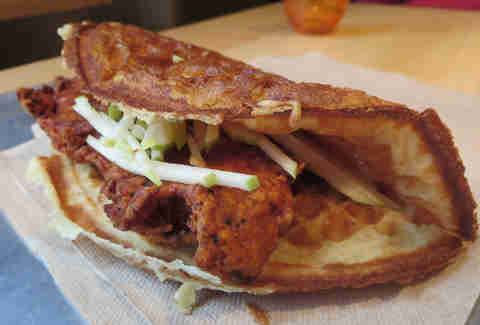 But this fried chicken and waffle "sandwich" was way better than we expected -- a really well balanced combination of spicy boneless chicken, cooling apple slaw, waffle, and maple syrup. Some places we tried seemed to be a little skimpy on the chicken. 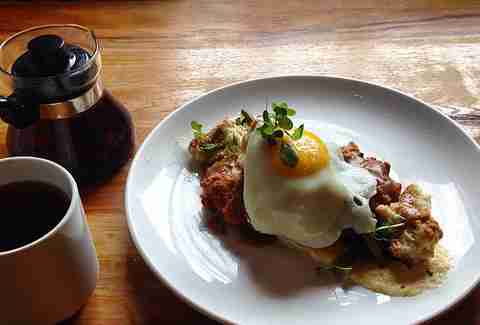 Not this West Side breakfast hideaway, which gives you a Belgian-style waffle and THREE big pieces of buttermilk-brined, extra-crispy chicken (which scatters flaky fried bits like snow with every bite). The chicken was a little underseasoned, but the honey mustard dipping sauce took care of that. You're right, those aren’t waffles -- the day we trekked to the far South Side to try this place, the waffle machine was out for repairs and we had to have our waffle in pancake form. No matter; the chicken wings were good, if a bit greasy, but the sweet potato-pecan pancakes were great, and the waitress ensured a return trip by saying magic words we’d never heard before -- "peach cobbler waffles". 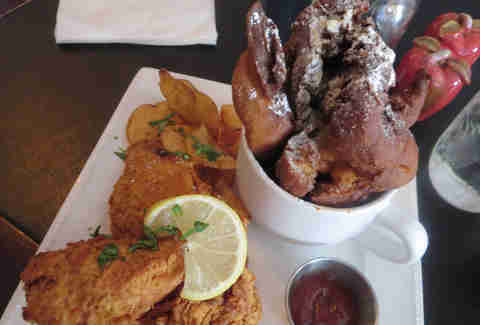 Of course this epitome of Logan Square hipsterdom has chicken & waffles. 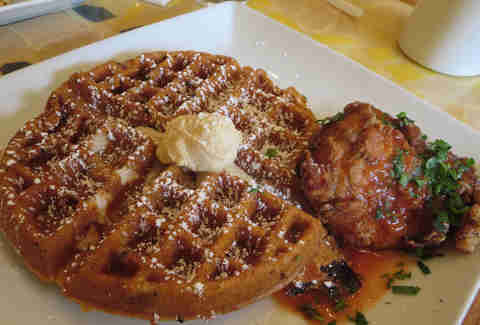 It incliudes a couple of excellent pieces of buttermilk-brined Slagel Farms chicken, served on a waffle that might seem a little skimpy -- if it didn’t also come with a serving of sweet potato pork belly hash. Of course. Yeah, you’re right, those aren’t waffles either -- they’re big, doughy fritters made of waffle batter, which fit right into the personality of this cute, chill neighborhood spot. The chicken was tasty even if just a smidge on the dry side (though the Harold’s-like sweet-hot sauce helps), but the whole place is just so darned lovable. Reportedly one of Rahm Emanuel’s favorite restaurants, the Bronzeville location of this local chain is a see-and-be-seen Sunday morning spot for the South Side. The chicken is good, the waffles are thin and soft, Waffle House-style, and the secret is to actually order your chicken separately, smothered under the terrific onion gravy. A unique restaurant for Lincoln Park, Batter & Berries does the wackiest version we’ve seen -- the sweet potato waffles are stuffed with bits of chicken (a little dry, frankly) and are accompanied by a scarfable boneless chicken breast in a sweet-hot sauce. It’s just crazy enough to work! 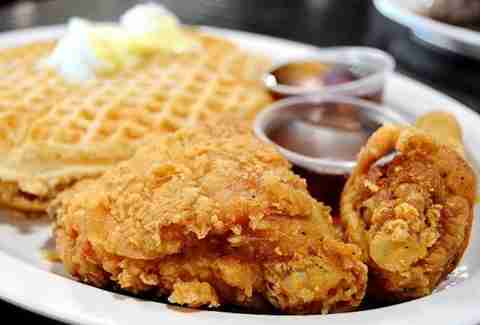 You know chicken & waffles have made the big time when they turn up at a posh Downtown spot like this hotel cocktail bar and restaurant. The buttermilk-brined chicken and perfect little round waffles are terrific, while the secret weapon is the dark, rich Burton’s maple syrup from Indiana. 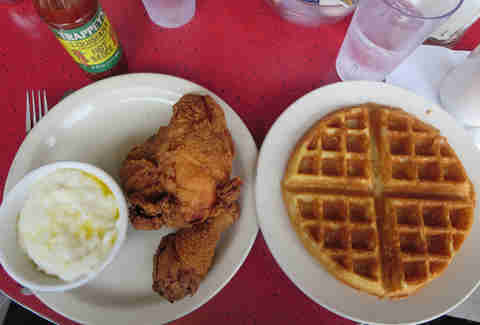 Not that there’s anything wrong with the waffle at this friendly, homey South Side breakfast spot --but it's just kind of a throw-in with the well seasoned, gorgeously crispy chicken, which wowed us to the point that it could be a new contender for best fried chicken in town, too. 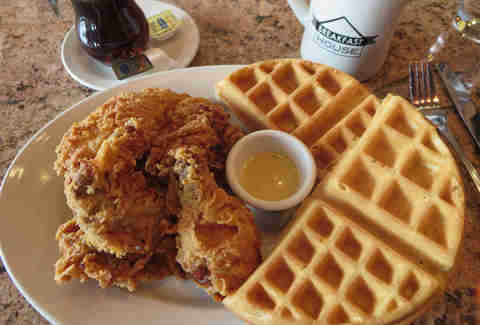 Extra bonus: the only place we found where your chicken &waffles can come with a side of grits. Lincoln Square’s underrated farm-to-table restaurant is a dark horse winner for one big reason: doing every single component of chicken & waffles better. The chicken, brined in black tea, ginger, and thyme (! 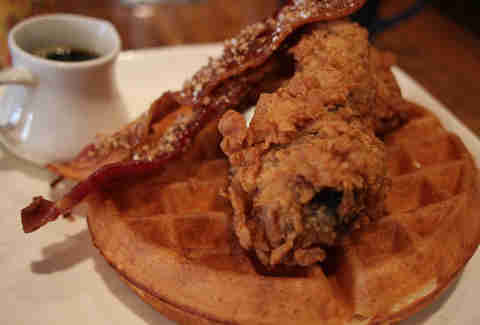 ), is fantastic, like having fried chicken and chicken soup at the same time; the waffle, made with malt flour, is light as a cloud; the syrup is Burton’s; and did we mention that it comes with a side of maple pecan-crusted bacon? Yes, BACON. Genius.